'Getting round' to creating a new website is something which many businesses (including ours) put off for far too long. It's only when you notice your Google rank dropping off that decision makers are prompted to take action. At RomanCart, our websites can track the development of the Internet and html technologies very accurately. Our original website (check out the wayback machine at https://archive.org/web to take a look) was designed for 640x480 desktops and did its job very well. Interestingly it had a lot of text information on the page with lots of relevant keyword which worked very well for SEO. Our next website was a more graphically pleasing version with Amazon inspired tabs and still plenty of text. That lasted until about 2009 when the demand for more graphically pleasing sites became apparent. We launched a great looking website and in fact got an agency to design it for us. That lasted for a few years until mobile devices really became important, so the next site (which we've just replaced) had a desktop and mobile version. Two completely separate websites served up depending on the users device. Now though, your website absolutely has to be responsive. 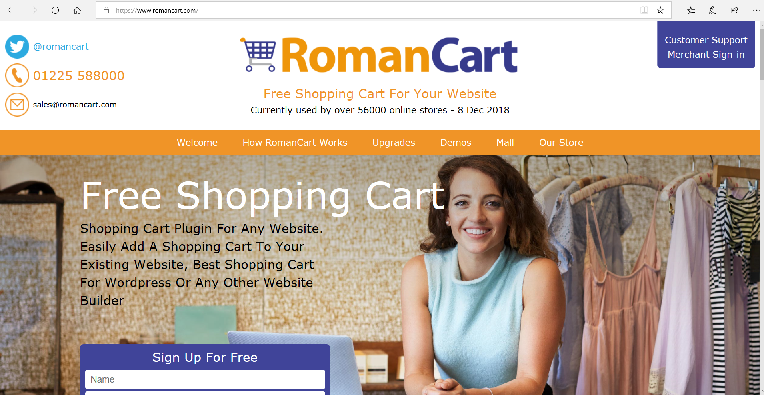 That means it needs to be a single website which will look great on any device, and that's what the latest https://www.romancart.com website does. In fact we noticed that google wasn't liking our previous site and was only spidering the cut down mobile version, which had a big negative effect on our search rankings. At this point I have to point out that if you're an ecommerce merchant whose website is still not responsive, then you absolutely must take a look at our other service at https://www.sellr.co.uk where you'll get a complete responsive website at very low cost. That's not the point of this blog though. We launched our new website a few days ago and already we're ranking really highly for terms we haven't ranked for in years. However - we didn't just do this by chance, a few years ago whilst developing our Sellr service, we wrote a series of tools to help us rank as high as possible. In fact if you search on Google in the UK for 'UK Ecommerce Software' take a look at where Sellr appears in the organic listings. That's a £16 click on Google Adwords! So - what tools did we use? Well - we've put them together to make a new service which we've called SiteBam and you can use the exact same tools on your website right now for Free whilst it's in Beta. Go to https://www.sitebam.co.uk and sign up, then take a look around. It does loads of things however, crucially it lets you analyse your website to see what keywords you are promoting to Google, tracks where you rank on Google, analyses other websites to see what they've done on their web pages, so you can do the same. The system will then notify you as your rank changes. It also shows you the actual search volume for the keywords so you can see if you're targetting the right ones. Go to https://www.sitebam.co.uk and sign up for a free account, it will upgrade you for a year at absolutely no cost. I promise you'll find it really interesting. Right now, it doesn't have a website and it's lacking our usual screencasts - but they're both on the way. Let us know how dramatically you manage to improve your rank on Google using those tools. Of course feel free to contact us if you need any assistance or advice on this or any of our services.